WASHINGTON, DC -- It's been nearly one year since 298 people were killed after a commercial passenger plane broke up over the Ukraine. 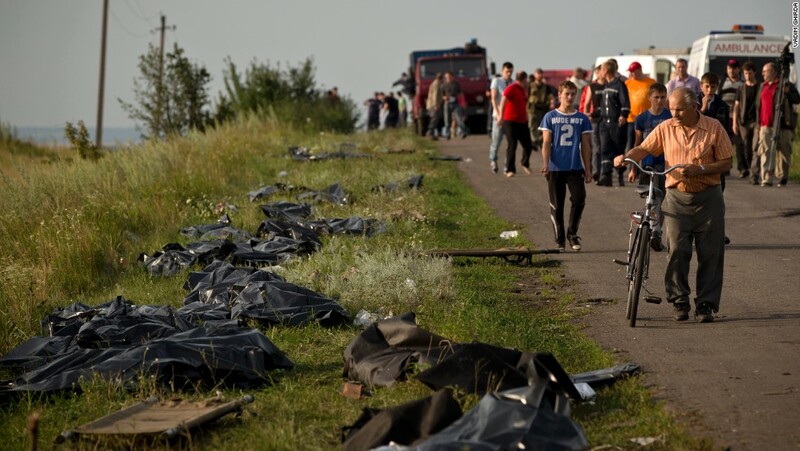 Victims' bodies from flight MH17, in Eastern Ukraine. U.S. officials concluded Malaysia Airlines flight MH17 was struck by a missile and shot out of the sky. A final report from investigators has yet to be released but CNN has learned new details from the draft investigative report for the July 17, 2014 incident. Dutch accident investigators say that evidence points to pro-Russian rebels as being responsible for shooting down MH-17, according to a source who has seen the report. According to the source, the report says it was a Buk missile -- a Russian surface-to-air missile -- that was used, launched from a village in Russian rebel controlled territory. The Malaysian Airlines flight went down in the Donetsk area of Ukraine. According to two sources with knowledge of the investigation, a draft of an investigative report authored by the Dutch Safety Board, the lead agency in the investigation, has been distributed for review to numerous agencies around the world including the National Transportation Safety Board, Federal Aviation Administration and Boeing. The draft investigative report is several hundred pages long. Another source with knowledge of the report's details says it gives a minute by minute timeline of flight MH17. This source also says not only does the draft report pinpoint where the missile was fired from it identifies who was in control of the territory and pins the downing of MH17 on the pro-Russian rebels. According to both sources, the report also pins some blame on Malaysia Airlines for how its planes were dispatched that day. Some airlines were avoiding the conflict zone. According to the report Malaysia Airlines was not reading other countries' notice to airmen or NOTAMs and it continued to fly over the zone. Notice to airmen or NOTAMs are written notifications issued to pilots before a flight, advising them of circumstances relating to the state of flying, and those notifications can include warnings of potential dangers like conflict zones. U.S. Airline Carriers for example make decisions about where to fly and where not to fly based on notice to airmen (NOTAMs) that different countries issue to their pilots. If for example, based on intelligence, Britain warned its pilots to avoid flying over a certain country U.S. Carriers would read and consider those warnings and decide if they too will avoid the area. The Dutch Safety Board is investigating the crash of flight MH17 but it is also investigating the decision-making process pertaining to safety when determining flight routes. Dutch investigators say in their report that because Malaysia airlines didn't review other countries' warnings it was unaware of conflict zones other airlines were avoiding. Sources who have seen the report say the Dutch Safety Board suggests Malaysia Airlines didn't have a robust system like other carriers. The NTSB leads the group of accredited representatives in the investigation which also includes FAA and Boeing. The standard process under international aviation law (ICAO annex 13) is to allow investigative parties to review the draft report to look for inaccuracies or any other discrepancies. Agencies like the NTSB will submit suggested changes/comments on behalf of its agency as well as FAA. The NTSB is currently in its final stages of putting together comments. The final report is expected to be competed and published in the first half of October 2015. CNN has requested comment from the NTSB, FAA, Boeing and the Dutch Safety Board. CNN has also attempted to reach representatives for Malaysia Airlines. The Dutch safety board told CNN "we will not comment on the confidential draft final report" and the NTSB said in an email "The NTSB does not comment on an investigation that the Board is not the lead investigative agency."